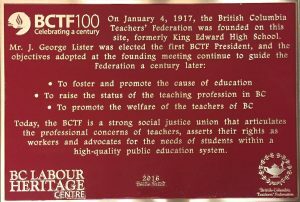 In 2017 the BC Teachers’ Federation (BCTF) celebrated 100 years since its founding meeting. 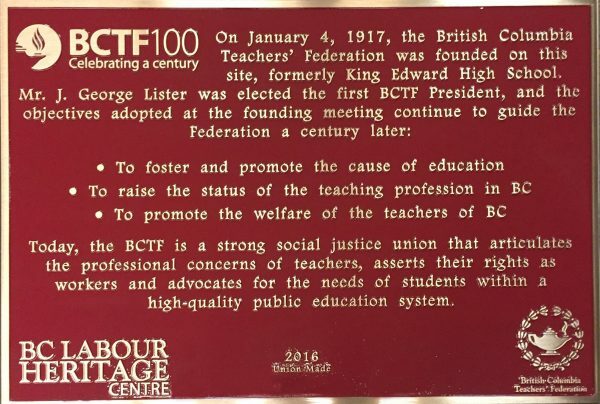 Over a long period of time the BCTF and its locals took many important steps towards the achievement of full collective bargaining rights for teachers. 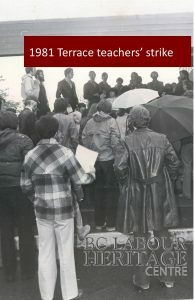 Those rights were not fully won until legislation in 1987 granted teachers to bargain for virtually all terms of conditions of employment with the right to strike. 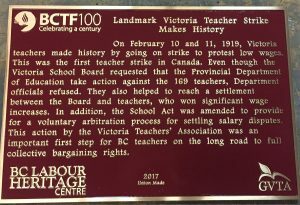 The story of the achievement of these bargaining rights was commemorated with a series of plaques recognizing steps along the road to full collective bargaining for teachers. 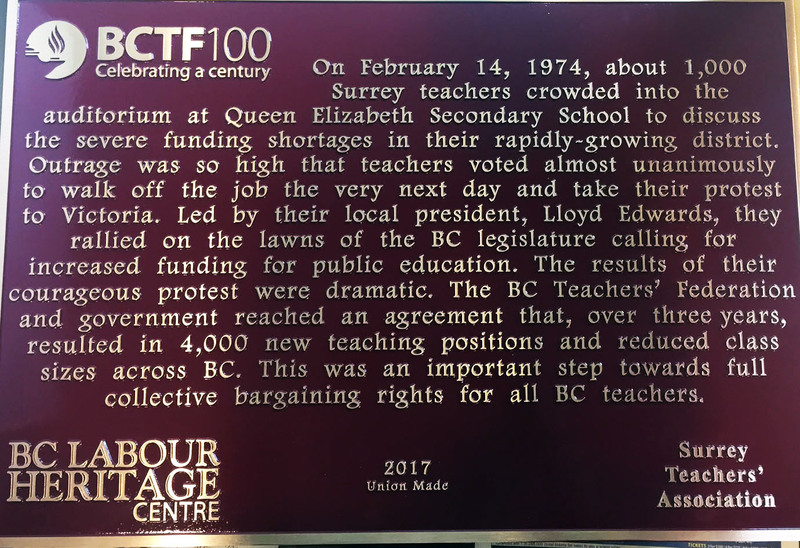 This plaque, located on the former location of King Edward High School at Oak Street and 12th Avenue in Vancouver (now part of the Vancouver General Hospital), recognizes the objectives and legacy of the BC Teachers’ Federation. 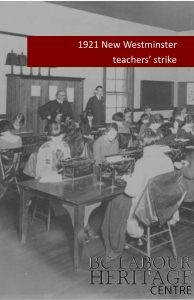 In 1919, in Victoria, 178 teachers went on strike over salaries constituting what was the first teacher strike in Canada. 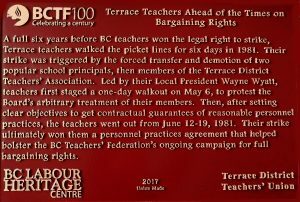 There was no legal framework for teachers to strike; local associations of teachers did not have any legal standing as bargaining units. 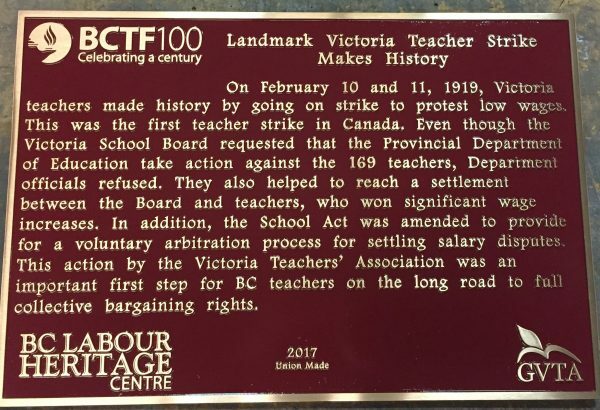 But, Victoria teachers struck nonetheless and forced government to introduce an early form of voluntary salary arbitration to resolve salary disputes. Located at South Park Elementary School, 508 Douglas Street, Victoria. 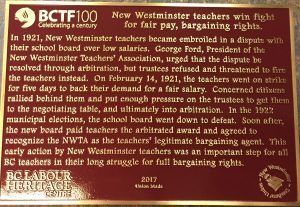 New Westminster teachers win fight for fair pay, bargaining rights. 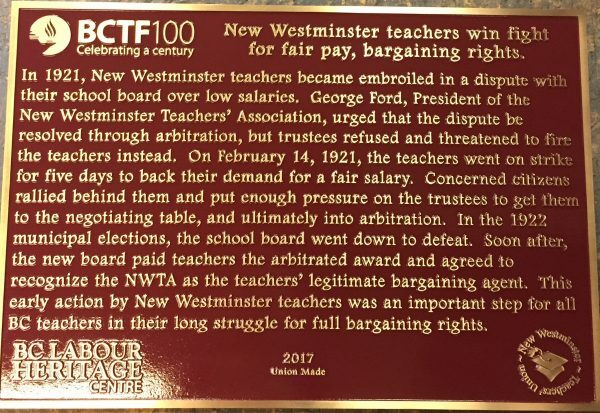 In 1921, New Westminster teachers went on strike because their Board failed to implement an arbitration award granted through the process of voluntary arbitration that had been established by government following the 1919 Victoria strike. 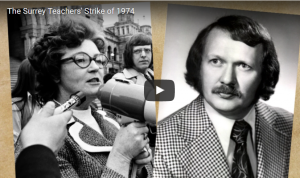 There was no legal framework for teachers to strike. It took the election of a new school board later that year to see the arbitration award successfully implemented. 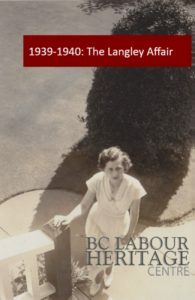 In 1939, Langley Teachers’ Association President Connie Jervis and her colleagues played a significant role in securing the right that would require School Boards to participate in binding arbitration to settle salary disputes with teachers and to honour the outcome of such arbitrations. 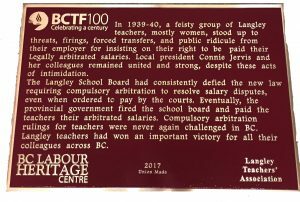 Langley teachers resisted attempts by their Board to ignore the arbitration award they were granted and even took their Board to court where they were successful in getting a decision to uphold their arbitration award. The Board still refused and Jervis and other teachers stood up to their board even after facing dismissals and transfers. The teachers ultimately prevailed against strong community opposition when the provincial education ministry fired the school board and had an appointed trustee honour the arbitration award. 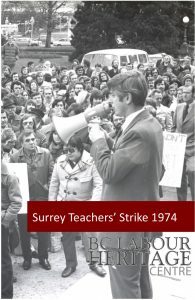 In 1974, with an education friendly NDP government in Victoria, and after years of BCTF campaigns to achieve class size reductions, Surrey teachers took action. 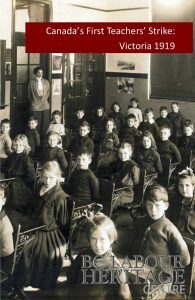 At this time the legislative framework for teacher bargaining included only salaries and bonuses with compulsory arbitration as the only resolution mechanism. Hence bargaining was not a vehicle to achieve working and learning conditions improvements. 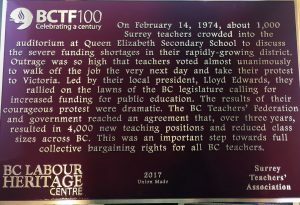 So, in the most significant demonstration of political action to that point in the BCTF’s history, Surrey teachers in mid-February, decided at a general meeting that the very next day they would not report for work and would board buses bound for Victoria to protest the huge class sizes that were affecting teachers’ ability to teach. The results of the walkout, confronting a government that had promised action on class size, were dramatic. 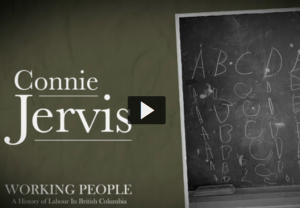 A three year program of successive class size reductions was introduced resulting in the hiring of thousands of teachers around BC and improvement in learning conditions for hundreds of thousands students. 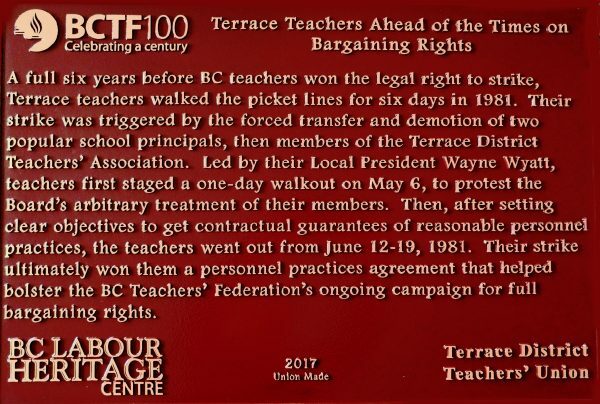 In June of 1981 teachers in Terrace engaged in a six day strike to have aspects of their working conditions included in an agreement with their Board. At this time, the legal framework for teacher bargaining required Boards to bargain only for salaries and bonuses. The only resolution mechanism for disputes was binding arbitration. So Terrace teachers challenged both of these tenets through their action. And they were successful. They achieved a number of provisions dealing with personnel practices in an enforceable agreement with their Board. 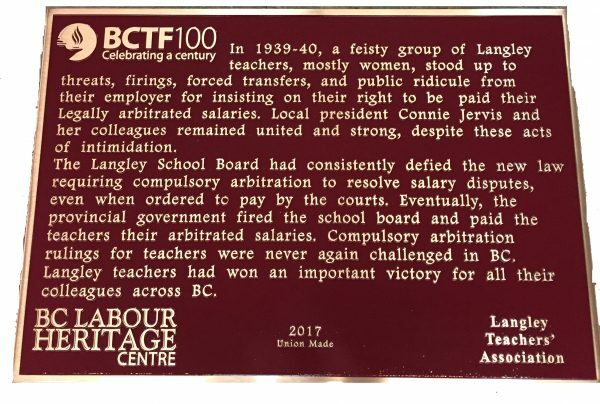 This was a very significant action for all BC teachers because it was used as a beacon for what was possible as teacher locals across the province geared up for a major BCTF led campaign to expand the scope of bargaining in the fall of 1981.